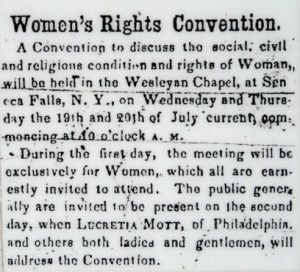 Located at 136 Fall St. Seneca Falls the Women’s Rights National Historical Park consists of four major historical properties including the Wesleyan Methodist Church which was the site of the Seneca Falls Convention, the first women’s rights convention. The Elizabeth Cady Stanton House, the M’Clintonk House and the Richard Hunt House are also on display. The park includes a visitor center and an education and cultural center housing the Suffrage Press Print shop. The Women’s Rights National Historical Park was created by Congress in 1980 to preserve and interpret the nationally significant historical and cultural sites and structures associated with the struggle for equal rights for women. As we begin on our path through the bi-centennial celebration you don’t want to miss out on a visit to the Erie Canal Museum. The museum is located at 318 Erie Blvd. East in Syracuse, collects and preserves Canal material, and provides engaging educational experiences that champion an appreciation and understanding of the Erie Canal’s transforming effects on the past, present and future. Listed on the NYS and National Register of Historic Places, the Chittenango Landing Canal Boat Museum is an important part of the history of the Erie Canal. The site sits at the intersection of the historic enlarged Erie Canal and the remnants of the circa 1822 Chittenango Canal. Originally constructed in 1855, the interpreted site preserved and rebuilt a 3-bay dry dock. Craftsman used the site’s three large, independently functioning bays to build and repair canal boats, maintaining and expanding this vital economic artery until the opening of the Barge Canal in 1918. The site includes the original drydocks and sluiceway, a canal side store, a sawmill, boat shop, blacksmith shop, mule stable, a walk on canal boat exhibit, sunken canal boat remains, a nature trail to a full width aqueduct, picnic areas, access to the Erie Canalway trail and a modern visitor center. We are currently writing articles to inspire, enlighten, and guide your discovery of the Erie Canal. New articles are on their way. Check back soon for canal news, guides, and history.